LaMichael Keondrae "LaMike" James (born October 22, 1989) is a former American football running back. James played college football for the University of Oregon. The 2010 season was a breakout one for James, as he rushed for 1,731 yards, the highest in the nation. He finished third in balloting for the Heisman Trophy that year and received the Doak Walker Award. In 2011, he became Oregon's career rushing leader and rushed for a school-record 1,805 yards. He was considered to be one of the top running backs throughout his college career, with his 5,082 total rushing yards placing him 2nd in Pac-12 Conference history and 14th in NCAA history. James was drafted by the San Francisco 49ers in the second round of the 2012 NFL Draft. James attended Liberty-Eylau High School in Texarkana, Texas, where he played for the Liberty-Eylau Leopards high school football team. As a sophomore, he rushed for 643 yards and 10 touchdowns on 76 carries. In his junior season, he totaled 1,600 yards and 16 touchdowns on 229 carries while adding 500 yards receiving and three touchdowns on 33 receptions. James continued his dominance during his senior campaign to the tune of 2,043 yards and 24 touchdowns on 230 touches, averaging 8.9 yards per carry. Considered a four-star recruit by Rivals.com, James was listed as the No. 12 all-purpose back in the nation in 2008. James attended the University of Oregon, where he played for coach Chip Kelly's Oregon Ducks football team from 2009 to 2011. After the suspension of LeGarrette Blount, James became the starting running back for the Ducks in 2009. He helped the Ducks to upset victories over Utah and California with 152 and 118 rushing yards, respectively. He again rushed for over 100 yards on October 10 against UCLA with 152 yards on 20 carries. Once again, James eclipsed the 100 yard mark with 154 yards rushing on 15 carries against Washington on October 24, and on October 31 with 183 yards to upset then #5 USC. He led all BCS-conference running backs with 6.9 yards per carry. On December 7, 2009, James was named Pac-10 Offensive Freshman of the Year. On March 9, 2010, head coach Chip Kelly announced that James would be suspended for the season opening game of the 2010 season, following his guilty plea for physical harassment against his former girlfriend. Against Portland State, James rushed for 227 yards on 14 carries and scored two touchdowns in a 69-0 shutout win, the Ducks' second shutout on the year. The next week, against Arizona State, James was held to only 94 rushing yards, but the total was enough to move James past the 2,000 yard mark for his career. Against the Arizona Wildcats, James rushed for 126 yards, 2 touchdowns and surpassed LeGarrette Blount's single season scoring record. James had a season high against the Stanford Cardinal by garnering 3 touchdowns, and 257 yards on 31 rushes. Over the course of the season, James had eclipsed the century mark 9 times, only failing to reach 100 yards twice. All in all James has had 18 100+ rushing yard games in his career, a record at the University of Oregon. 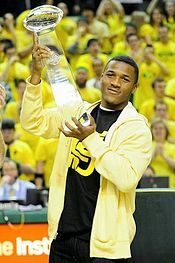 Despite missing the first game of the 2010 season, due to suspension, James managed to break the Pac-10 all-time sophomore single season rushing record, and led the country in both rushing yards (1,682) and touchdowns (22), ultimately earning a trip to the annual Heisman Ceremony in New York as a finalist. Following James' 2010 season, he received the Doak Walker award, given to best running back in the country, and was recognized as a unanimous first-team All-American. He was also a Pac-12 All-Academic selection. The Ducks finished regular season play undefeated (12-0) and ranked No. 2 in both the BCS and the AP poll. They played the top-ranked Auburn Tigers in the 2011 BCS National Championship Game in Glendale, Arizona. In that game, James had two touchdown receptions, including one that set up the game-tying two-point conversion. Nevertheless, James' season ended with disappointment when Auburn kicked a game-winning field goal as time expired for a 22-19 win. In the first game of the 2011 season against LSU, James became Oregon's career rushing leader, surpassing the mark previously set by Derek Loville. In the third game of the season against Missouri State, James ran for 204 yards and three touchdowns, which was his 4th career 200+ yard rushing game. On September 24 in a game against Arizona, James rushed for an Oregon single game record of 288 yards on 24 carries. On October 6, 2011, in a game against California, James fell awkwardly on his right arm and left with an air cast. In a post-game statement, he announced X-rays were negative for a break and that he had suffered a dislocated elbow but popped it back into place before leaving the field. On December 2, 2011, James won the Pac-12 Championship Game MVP, while rushing for 3 touchdowns. On January 2, 2012, James rushed for 159 yards on 25 carries with one touchdown to help Oregon beat Wisconsin 45–38 in the Rose Bowl. James was also a track & field star at the University of Oregon. Despite limited workouts with school’s track team, he scored 5th in the 2010 Pac-10 championships at the 100 meters, posting a personal-best time of 10.50 seconds in the semifinals. He also anchored 4x100 relay to 4th place. He ran a career-best time of 6.77 seconds in the 60 meters at the 2010 Washington Husky Invitational, placing 3rd in the finals. James was drafted in the second round with the 61st overall pick by the San Francisco 49ers in the 2012 NFL Draft. His college success did not carry over to the NFL. During his rookie season, James played in his first career regular season game against the Miami Dolphins in Week 14. He carried the ball 8 times for 30 yards and had a 3.7 yard avg. He also caught a 15-yard reception. In Week 15 against the New England Patriots, James had 8 carries for 31 yards. He also had a 62-yard kickoff return after the Patriots had completed a 28-point comeback to tie the game up, leading to a touchdown the next play for the 49ers. James scored his first NFL touchdown in the 2012 NFC Championship against the Atlanta Falcons. James and 49ers reached Super Bowl XLVII in the 2012 season. In the game, he had 3 rushes for 10 yards but lost a fumble as the 49ers lost to the Baltimore Ravens by a score of 34–31. He requested his release early during the 2014 season, and was officially released on September 8, 2014. James signed with the Miami Dolphins practice squad on September 30, 2014. He was promoted to the active roster on November 10, 2014, after a season-ending injury to left tackle Branden Albert. He was re-signed by the Dolphins on March 20, 2015. Prior to the 2015 season, Lamike informed the media that he preferred to be addressed as "LaMike", stating his friends, family and teammates have always called him LaMike. James was waived by the Dolphins on September 14, 2015. James was born in New Boston, Texas to Rosemary James. He was raised by his maternal grandma, Betty James, in Texarkana, Texas. His dad was killed before he was born. ^ GoDucks.com, Ducks Football, 2011 Roster, cousin Drekkerius Hicks of Greenwood,Ms is a track star and is currently number1 in the state of Mississippi SPSID=3378&SPID=233&DB_LANG=C&DB_OEM_ID=500&ATCLID=1550427&Q_SEASON=2011 #21 LaMichael James Archived April 19, 2014, at the Wayback Machine. Retrieved June 23, 2012. ^ a b "LaMichael James #21 RB". ESPN.com. Retrieved September 26, 2009. ^ "Tenth-ranked Ducks hand Trojans worst loss since '97". ESPN.com. October 31, 2009. Retrieved October 31, 2009. ^ "LaMichael James Player Card". ESPN.com. Retrieved November 16, 2009. ^ "Ducks Burn Sun Devils in Biggest Snooze-Fest of the Year". bleacherreport.com. Retrieved November 16, 2009. ^ a b "Gerhart, Price and Kelly lead All-Pac-10 team". ESPN.com. December 7, 2009. Retrieved December 7, 2009. ^ "James suspended for opener". ESPN.com. March 12, 2010. Retrieved March 12, 2010. ^ 2011 NCAA Football Records Book, Award Winners, National Collegiate Athletic Association, Indianapolis, Indiana, p. 12 (2011). Retrieved June 300, 2012. ^ "Tigers Outlast Ducks in Dallas". GoDucks.com. September 3, 2011. Retrieved September 6, 2011. ^ "No. 9 Oregon routs California 43-15 but LaMichael James suffers injury". OregonLive.com. October 6, 2011. Retrieved October 6, 2011. ^ Odom, Joel. "Rose Bowl: De'Anthony Thomas and LaMichael James speed past Badgers (video)". OregonLive.com. Retrieved December 16, 2017. ^ Wilkening, Mike. "Agent: 49ers releasing LaMichael James". Pro Football Talk. Retrieved September 11, 2014. ^ "Miami Dolphins Sign LaMichael James to Practice Squad". thephinsider.com. Retrieved October 1, 2014. ^ Alper, Josh. "Dolphins confirm Branden Albert out for season". Pro Football Talk. Retrieved November 10, 2014. ^ Alper, Josh (March 20, 2015). "Dolphins bring back Louis Delmas, LaMichael James". NBCSports.com. Retrieved April 5, 2015. ^ Sports, Fox. "Dolphins RB LaMichael James wants to go by LaMike". Retrieved September 8, 2015. ^ "James Cut". Sun-Sentinel. Retrieved September 14, 2015. ^ "Oregon's James Headlines 2010 FBS Coaches' All-America Team". AFCA.com. November 29, 2010. Archived from the original on November 30, 2010. Retrieved November 30, 2010. ^ "FWAA Names 2010 All-America Team". SportsWriters.net. December 11, 2010. Retrieved December 12, 2010. ^ "121st Walter Camp All-America Team Announced". WalterCamp.org. December 9, 2010. Archived from the original on March 15, 2012. Retrieved December 12, 2010. ^ "Pac-10 Football Awards and All-Conference Team Announced". Pac-10.org. December 7, 2010. Retrieved December 12, 2010. ^ "2009 Sporting News College Football All-American Third Team". SportingNews.com. December 15, 2009. Retrieved December 15, 2009. ^ "Ingram, McClain lead 6 Alabama AP All-Americans". Associated Press. December 15, 2009. Retrieved December 15, 2009. ^ "Rivals.com 2009 All-America Teams". Rivals.com. December 15, 2009. Archived from the original on January 3, 2010. Retrieved December 15, 2009. ^ "Masoli, Mohamed and Costa Named Pac-10 Football Players of the Week". Pac-12.org. November 23, 2009. Retrieved November 23, 2009. ^ National Football League, Current Players, LaMichael James. Retrieved June 23, 2012.